The National Water Training Center (NWTC) offers a range of specific training courses for all professionals.. The NWTC will meet your regularly to discuss important current issues in the water world. Exchanging, learning, comparing your experience with the presented case studies, assessing the state of the art and regulatory changes, is the program that is proposed to you. Slice rule for "Drinking water"
For open channel flows, this rule will allow you to determine the diameters of the pipes to be installed according to the flow to be conveyed and the slope available in the field as well as the water heights in the partially filled pipes. Validate your free surface flow rate measurements with the Standard Rule. 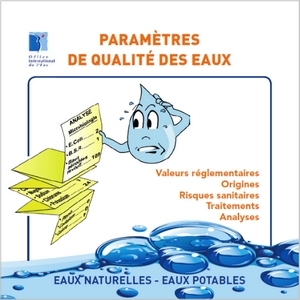 A 50-sheet booklet to define the calcocarbonic balance of a water body and to know its aggressive or scaling nature, to calculate the treatment rates of the correction reagents and to monitor the quality of the water produced. The Self-Monitoring and Control Kit (MASC) was specifically designed to monitor your station with less than 10,000 population equivalents per year. At the core of a national and international partners’ network, the International Office for Water collects a constant flow of news, in France and worldwide. Aquaveille is the tool for disseminating this watch, available in the form of a weekly electronic letter, but also in the form of a continuous information flow via a mobile application. Water in the city (eau dans la ville) is a service rendered by the International Office for Water to help the communities. It is intended for EPCIs (Public Institutions for Inter-municipal Cooperation), mayors, local elected representatives and their services, as well as for the delegated companies. It proposes practical, technical, legal and economic answers to questions related to drinking water supply, community and on-site sanitation. A range of practical and educational guides developed by our trainers. The technical booklets explain major water issues in a simple, playful and educational way. IOWater offers technical documents on current knowledge on topical problems in the field of water. This collection, initiated in 1997, offers, with more than 260 titles available, an overall coverage of the themes related to small and large water cycles. IOWater presents a reference book for monitoring water quality, with: regulatory values, origins, health risks, treatments and analyzes.